If it were a detail in a satirical novel, you’d criticize the author’s overly broad brushstrokes and say it’s the stuff of first drafts. Page Six reports producers are courting Sean Spicer for the next installment of “Dancing with the Stars” while Trump’s former press secretary tries to figure out next steps — which sadly don’t appear to involve a long, languid waltz out of public consciousness forever. Spicer was in New York City this week, gabbing with producers about a potential career in television, where he could visit talk shows and share inside info on all things Trump. On the heels of his resignation Friday, sources saw Spicer heading out of meetings with high-level execs at NBC, ABC, CBS, and Fox News. 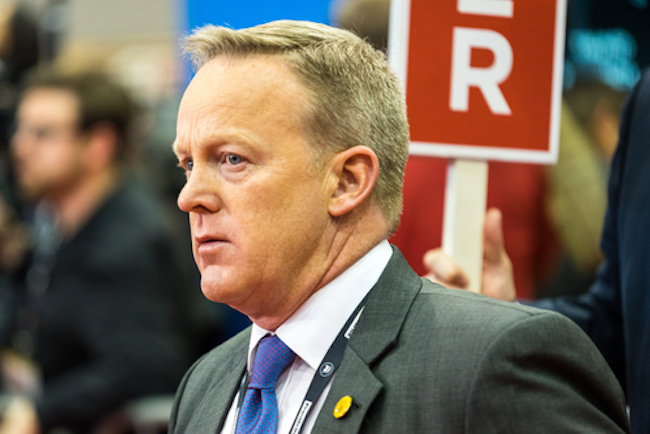 One source told Page Six news execs “made the full-court press” as they tried winning favor with Spicer while others merely “kicked the tires”. If Spicer does land on the show, it’s sure to echo former Texas Gov. Rick Perry‘s stint on the show, which wasn’t remotely cute and found him booted off after only two episodes. Does that sound like a definite “Yes” to anyone else? This is getting too good to not be fattening. I’ll bet a dollar that by next Friday Trump and Scaramucci/Scaramanga or whatever the hell his name is will be using the F word in public to describe each other. As for this useless POS I have no sympathy for at all. He knew what he was joining and knew he would have to defend it. He gave it his best but even he could no longer hide from the truth. That truth was he was on the wrong team and he knew it (all along he knew it). I’m not one of the idiots who supports human trash like Spicer by watching a show that pays him. Nobody gives a sh*it what Sean Spicer does. Seriously, people are supposed to look forward to this turd being on a dance show? Seriously? What, you don’t have a life? Dancing with the Stars is like Rehab for failed Republicans. Sean Spicer – the guy who could look at a picture of an empty field and say it was the largest crowd in history. Please, please make this happen. I would love watching him partner with Melissa McCarthy on the show. That, or Alec Baldwin in his Trump character. Pure gold. After working for Trump, for Spicey it’s going to be more like Dancing with SCARS. The network asking him is not the same as him “likely” participating. Your headline isn’t true. Your headline isn’t even close to true. People’s lack of reasoning skills gave us Trump. And yet here you are, failing to think. Since when is a politician a “star”? Oh I forgot, we have a reality show president. Never mind.